Please keep France in your thoughts and prayers. Our world needs more peacemakers and less hate mongers. I’m running a few weeks maybe a month behind in my postings verses my stitching. Most of these flowers were stitched during Major League playoffs and World Series but I can’t write that fast. 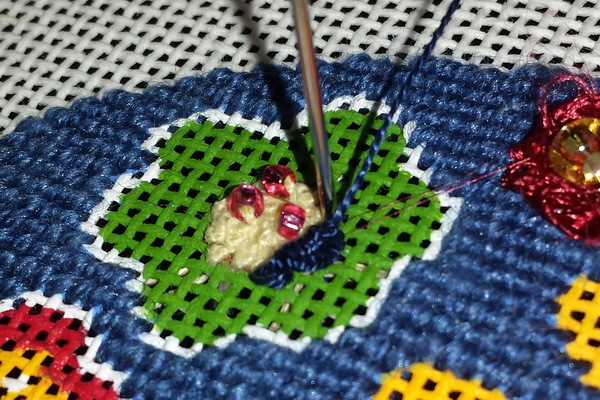 I don’t know how some of the needlepoint ladies post almost every day…I’m lucky to do one a week. But that’s a whole other story. waiting to be tried. So I decided this was a good area to experiment with these not so new needles. 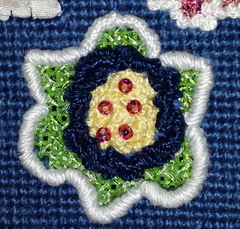 I used the Chenille needles to make these Cast-on Bullions in the green flowers. 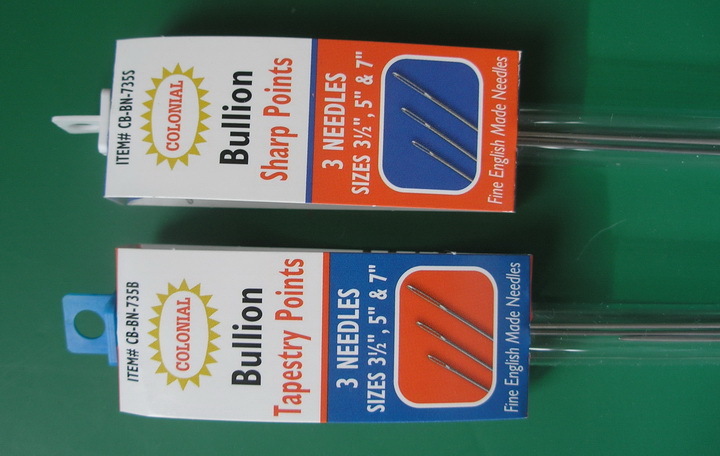 Cast-on Bullions are different from Bullions Knots: Bullion Knots you just wrap the thread around the needle; with Cast-on Bullions you twist the thread like you were casting on stitches for knitting. Depending on how you do this casting on decides how the Cast-on Bullion will look. 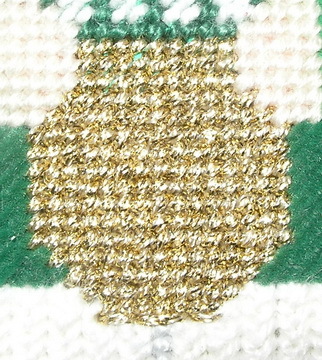 Casting on the same turn every stitch will make the bullion twist in a corkscrew like manner. 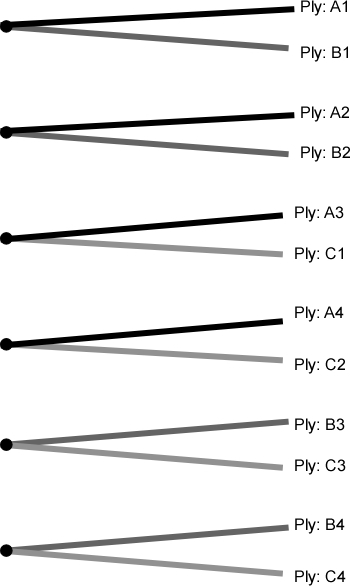 Casting on every other turn will give you a more jagged turns. These knots were fun to do but time consuming. 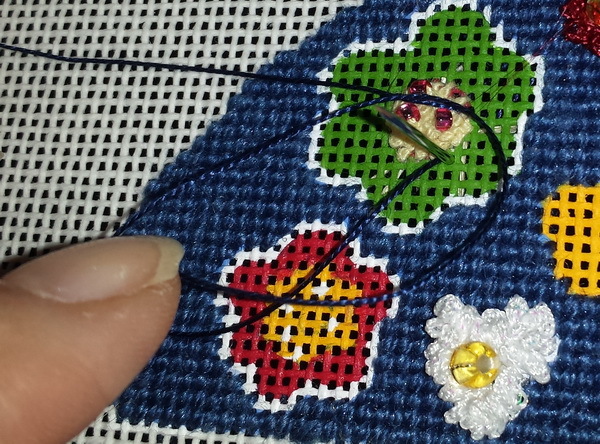 Then I filled in the green areas with Woven Plaited Stitch and then more Bullions in white perle. I think these flowers took me the four American League Games to stitch. 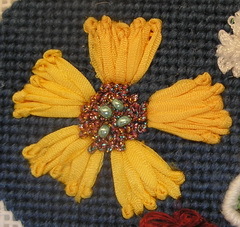 The other green flower on the wing was French Knots and the Woven Plait …the Bullions had done me in by then. 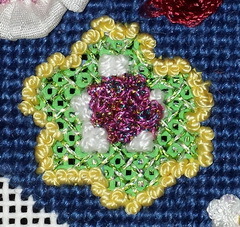 This flower was stitched with Kreinik green and Confetti pink, perle cotton and floss. Another night I stitched the large yellow flowers on a wing and small side piece. I used yellow silk ribbon again to stitch French knots on stick for the petals and then filled these in with either White perle (small side) or Confetti pink French knots and embellished both with pink beads on the white and green beds on the pink. Betsy is finished but she almost did not get a tuff-it to sit upon. I decided to use Ultra Suede for the cushion. 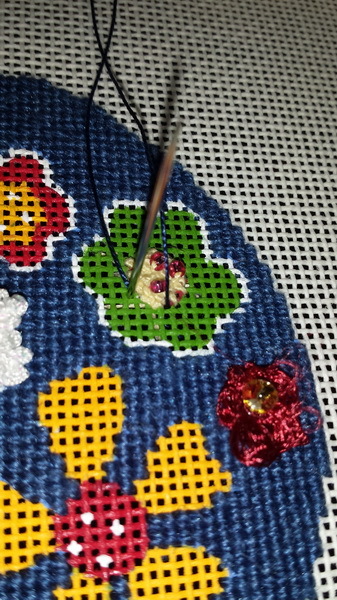 I used short lengths (12 inches and a larger than normal needle) but I still had trouble. My thread kept breaking. After several breakages, I cut another piece and gentle pulled on both ends and it broke. At first I thought it was breaking where the Ultra Suede was bent around the edge of the card but this didn’t seem to be the problem (although the thread did break here a few times.) What it seemed to me to be more likely was it was an old thread. I have had this thread for a couple years and I do not think it has stored well. I did get the tuff-it stitched but it took a great amount of patience…probably would have been quicker to get up and get another thread but I am lazy and stubborn. Anyone else had problems with this thread? 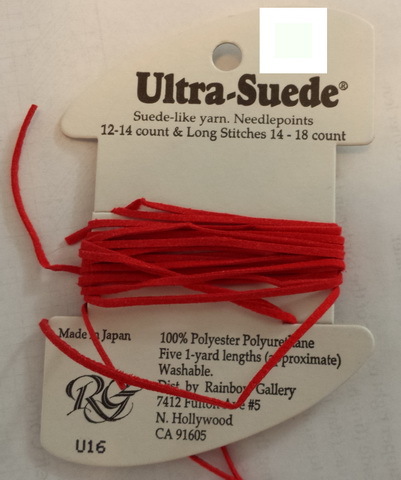 I am going to check my other Ultra Suede and if they are as unstable I am going to dispose of them. 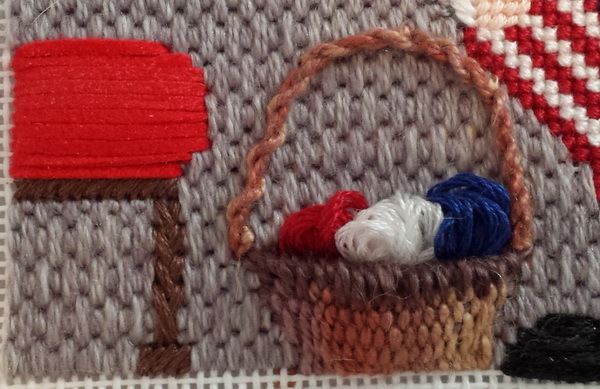 Frustration is not part of my stitching world. Betsy’s cap is Alternating Scotch Stitches and again I stitched the scallops in tent and then before adding the bullions, I French Knotted some hair for Betsy using an overdye. You can see in the picture it started to diagonal stripe…that’s because I stitch everything I can diagonally, so I tried the puddle method. (see: https://sudukc.wordpress.com/2013/10/01/overdye-puddle-stitching/ OR https://sudukc.wordpress.com/2014/04/25/back-to-mom-me/) I’m not too sure I was successful but I don’t think it will be as visible once she is finished. 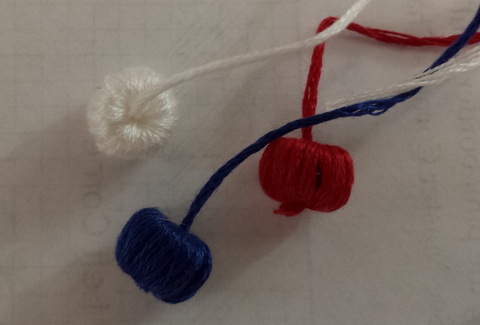 After the knots were in then I did bullion knots around the cap. I’m pretty good at bullions now. I also did needleweaving a basket for Betsy and was going to cover pony beads with floss and place them in the basket for balls of yarn/thread. But I did not leave enough give in the basket and I don’t think it would have worked anyway…I think the beads would have been too large, but you can see I tried and I prefer what I did better..
Betsy was a fun take-a-long, I really like stitching Anne Stradal, ABS Designs (http://www.absdesignsonline.com/ or http://thecapestitcher.blogspot.com/) canvases; she paints a great canvas. My husband has hinted he likes lighthouses, so now I have an excuse to buy more canvases 😉 …I like this idea. 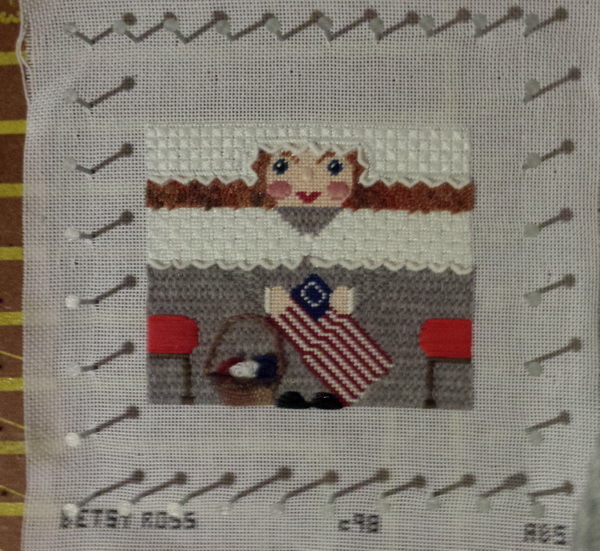 So Betsy is on the blocking board and will be finished soon…maybe not in time for the fourth of July but before too long. It’s back to finishing for me and I promise to have something (finishing) to show next time. I am stitching but have decided my big project for summer is finishing…And I have a million things that could fall under this heading. I could finish about seven or eight original stitching designs in my computer (many in various stages of completion); or I could finish one of those class projects that I plan on getting back to someday; or I could finish the 25 Temari balls I have made; I could learn needlefelting that I played with at Christmas last year and I have a thousand ideas running around my head (oops that is not technically a finish)…Okay you get the idea more things to do than the hours in a day. But I have decided to finish some of the needlepoint I have on blocking boards and in a UFBS box (Unfinished but stitched). I will take pictures as I muddle through this process and share with everyone. I’m guessing by Sept 1 I will really love my finisher and whatever she charges will look good to me. Since I am carrying my cell phone everywhere these days I’ll have a camera at hand. I am carrying my phone because I have a step counter app installed…it is supposed to remind me to get off my *** humm and walk a certain amount of steps a day. I have a goal (haven’t met yet but have come close)…I really think this is a hopeless cause unless the app can figure out a way to jar me loose from the project at hand…I just keep saying latter. But I digress…so finishing is the project of summer…Maybe I’ll have some of those gifts for family and friends finished by the start of the holiday season instead of being last minute Nelly. But today I do want to show you my current stitching project. I love these small projects that I can take anywhere…Anne Stradal, ABS Designs has the cutes roll-ups, I’ve stitched several over the years and her lighthouses are to die for and I love the way she needle blends her floss for skies and seas. If you are not familiar with her blog (http://thecapestitcher.blogspot.com/) and website (http://www.absdesignsonline.com/ ), grab a cuppa and spend awhile with Anne, her designs are fun and her stitching is wonderful. 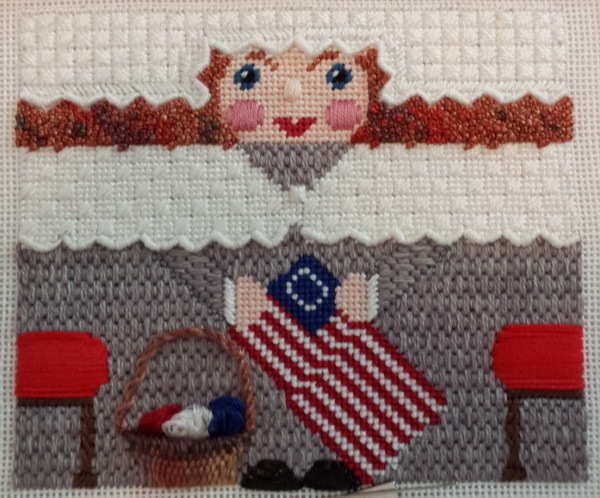 I am stitching Betsy Ross…I have stitched Thomas Jefferson (he’s in the UFBS box) Betsy’s dress is stitched with Rainbow Tweed and I have three card of the same color. And I am guessing that by the printed number on the bottom I have at least two different dye lots, but when I look at the cards side by side there could be three dye lots. So rather than take the chance of stitching and mixing up the three dye lots, I am mixing them up in the needle and stitching with all three. We all know what happens if you assume a dye lot is the same…that nasty stitch ghost comes to visit and you have a mess. After you are done stitching you can see the difference in the dye lots and you are haunted by the mess until you frog stitch it out. Then of course you don’t have enough thread to redo so you have to head over to LNS for a replacement and more (never can go for just one thing). And then you have more dye lot differenced (unless of course you just bought this thread from LNS and then maybe you’ll be lucky and she will have same dye lot…but if you’re not sure then mix them up in the needle and avoid the hassle. 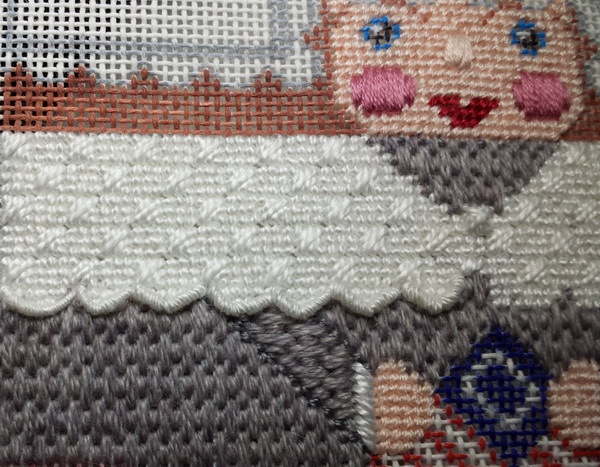 to be stitched; there is always the exception to this rule…ruching is where one ply of a thread is pulled to gather the thread. Ribbons are ruched and then the ribbon is couched into place for an effect. 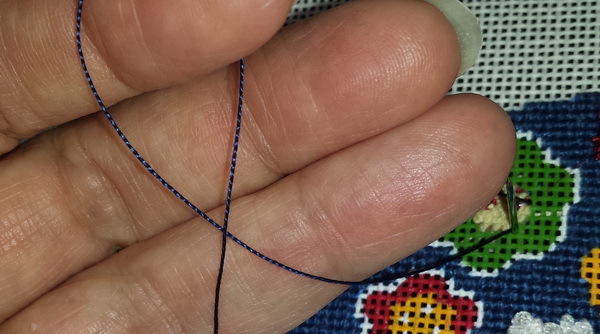 Almost any thread may be ruched. 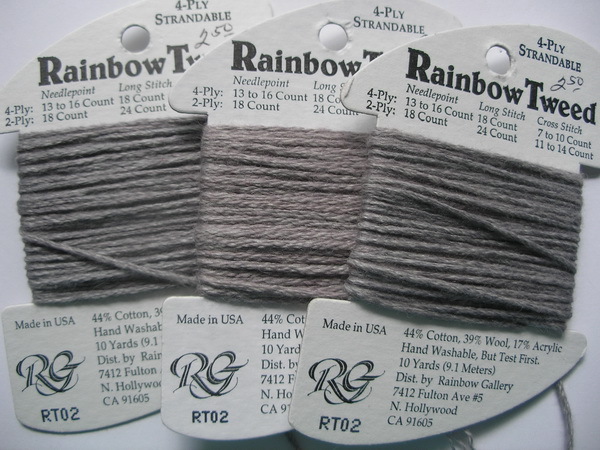 Rainbow Tweed is a divisible thread; there are 4 plies to one strand of thread. 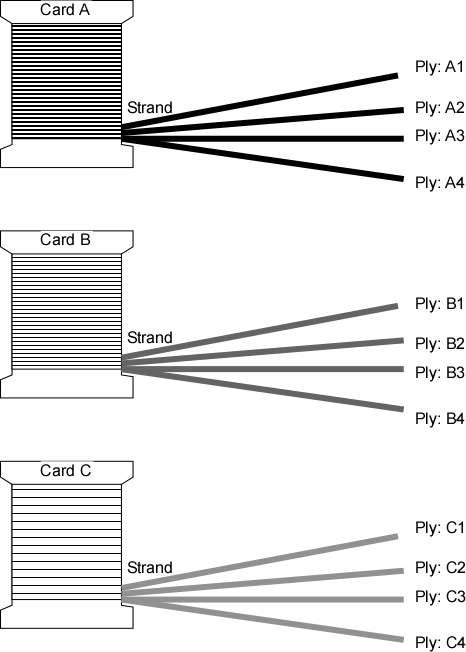 So I pulled the same working length off each of the three cards and I am stitching with 2 ply of this thread so I mixed one strand/4 ply (Card A1-4, B1-4, C1-4) as follows,: A1&B1, A2&B2, A3&C1, A4&C2, B3&C3, B4&C4. I paid no attention about the ends I put together but I did knot one end just to keep the two plies together not as a stitching direction. I dropped these in my stitching bag and randomly pulled a thread as I needed. You can see the results, no ghostly dye lot changes. Then I stitched her shawl and didn’t like the way the bottom was looking so decided to fill scallop with tent and then to give it some texture I would subject myself to Bullions. Bullions are not my favorite stitch but I think it is just because I don’t do them often enough. Practice makes better…with bullions there is never perfect. Normally I would wait to do the Bullions last but I got carried away and so they are in. The flag is over one cross stitches with 3 ply floss. I am so sorry I have been gone for a couple weeks but my plate finally broke and I just had to let some things go. I have a huge project on my desk right now, but yesterday I felt like I had gotten a grip on it and I could breath. And to compound things I also got an infection and the medicine almost did me in…this is truly a case of the cure was worse than the disease! I am allergic to penicillin but the doctor assured me it was a new variety and so I tried it. Gave me a shot in the office and I had no adverse reaction, so I took the prescription. Three days later I my stomach was churning and my head pounding so hard I thought some kid was sitting outside my house with his “bass woofers” turned up. Stopped that prescription, called the doctor, he sent a second prescription…took one pill and that was it. I was NOT going to die from the cure! No more meds…if the infection comes back I will deal with it then. This all happened the week-end of St. Patrick and last Saturday (March 24th ) was the first day I felt normal. Needless to say, Torin Ailfred O’Patrick was not well rounded for St. Paddy’s day. He was finished stitching, BUT flat. 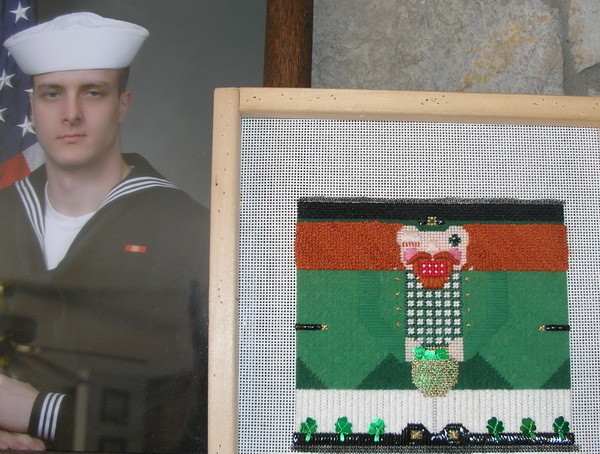 He was finished before I hit rock bottom and was headed for the finishing table but only made it as far as the mantle to share his space proudly with the navy (one grandson) on the mantle). Toppy knows next year he will be a well-rounded leprechaun. Toppy got His finishing touches; gold buckles and buttons …buttons were upright cross/French knots: Small horizontal straight stitch and vertical French knot, a nice filling stitch. Remember the marks I made at Toppy’s shoes? This was to remember where the shamrocks had been and I couched shamrock sequins. 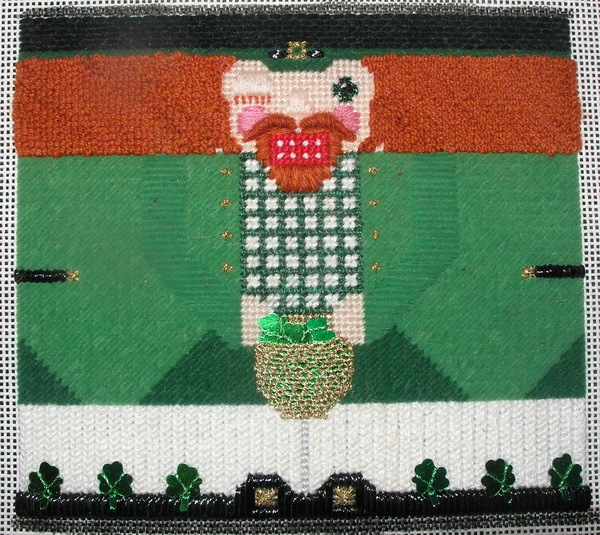 Toppy’s bag of shamrocks is needleweaving. 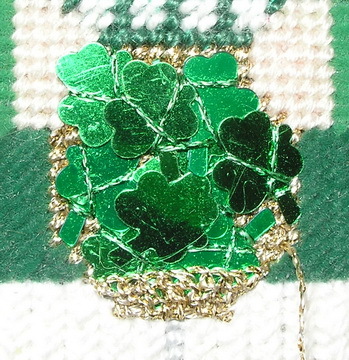 First I basketweaved his gold bag , then couched shamrocks and over that needleweaving using a buttonhole stitch. Start at the bottom with straight stitches and then buttonhole up to desired size adding and reducing stitches as needed. 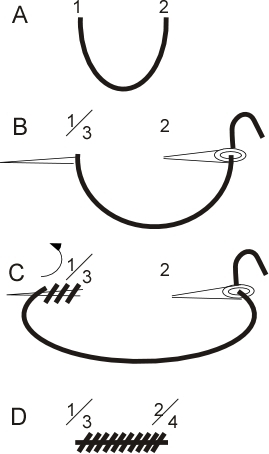 This stitch is worked from left to right; just sink thread on right and carry back to left side. 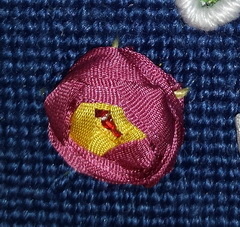 The detached buttonholed may be worked first and then the embellishments just placed in the buttonhole bag. Toppy wanted his mustache and hair to be his crowning glory. I filled his beard with directional straight stitches and overstitched them to give a fuller appearance; I even filled in the mustache area. 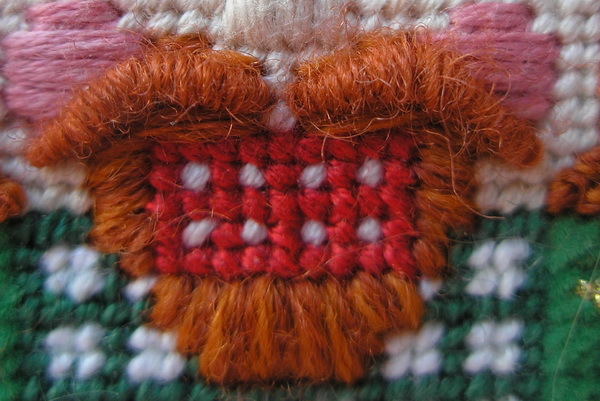 Over these stitches I did two very long bullion knots for his mustache and couched it into place. 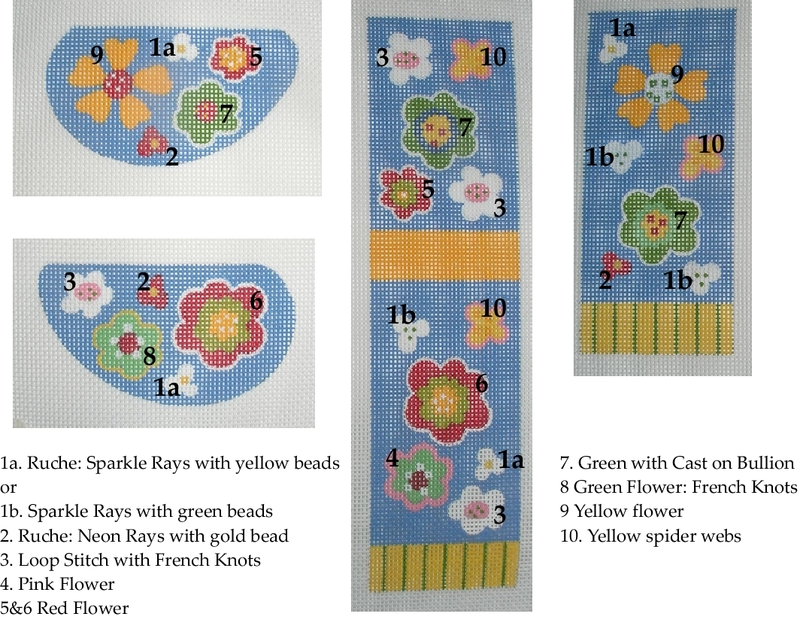 And his crowning glory…over 1000 French Knots…TMI(too much info)? That’s just the guess-tee-mate because I piled them on just to give him a thick set of curly locks. 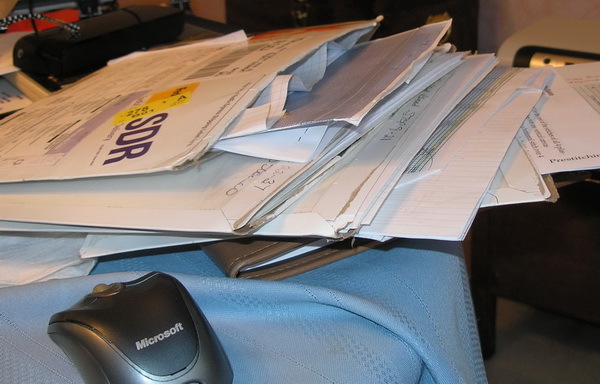 This is my temporary desk piled high with 5 Fed EX envelopes delivered to me during my melt down…I worked when I could and had most completed in time but Tuesday was the first day I felt almost caught up . Easter time has lots of Random Stitched pieces. Bunny in yellow sweater was not meant to be a realistic interpretation of a bunny, but I stitched his fur like I thought a real bunny would look. On the face you can see all the stitches radiate from his nose. 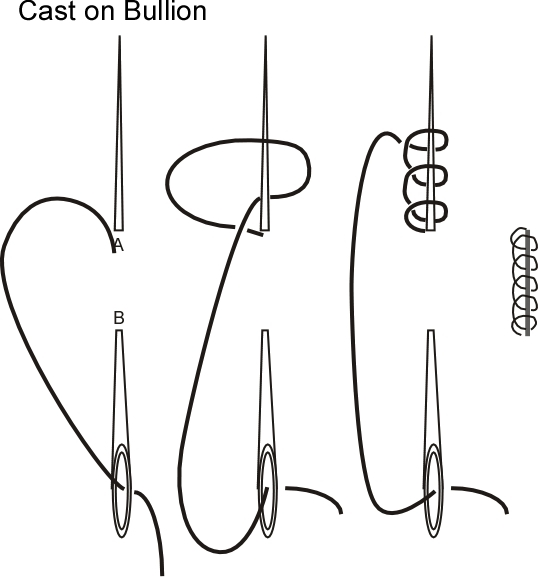 The ears are separated by a row of tent and are stitched to the contour of the shape. His paws were stitched in separate areas; each paw looked like I was three separate sections. Another whimsy bunny is the bunny in a carrot. His ears were Random Stitches and the thread, Peluche helped accent this stitch. In fact really long stitches could be used here since the thread had such great texture. And my favorite bunny is Peter. Peter was a kit from Creative Needle (I think)… sometimes you still see him on Ebay. When I first went to work at a local shop, every Grandmother in our area stitched this bunny for her grandchildren…every grandmother but me. I just did not care for kits nor did I like the threads in this kit. Our store model sat right above our Epic threads and people would ask me how I liked Epic. I’d never tried it so all I could tell them was others who had stitched with it seemed to like it. One day Peter and Epic threads came together in my head and so this Grandmother bought Peter and stitched him. The only threads from the original kit were the threads used in his eye, nose and mouth. His fur is 5 Epic threads, blended together. He is my favorite stitched bunny and probably one of the best Random Stitches I have stitched so far. The Tailor of Glostershire on my stitching bags is also Random Stitch. Again I probably used 6-8 different Epic threads. The Eagle I did for my Grandson he achieved the rank of Eagle Scout in the Boy Scouts of America. The original canvas I bought on Ebay; I contacted the designer and was told the canvas was no longer painted and would not paint the multiples I requested! I wish I had kept the original canvas, but that’s another blog too. 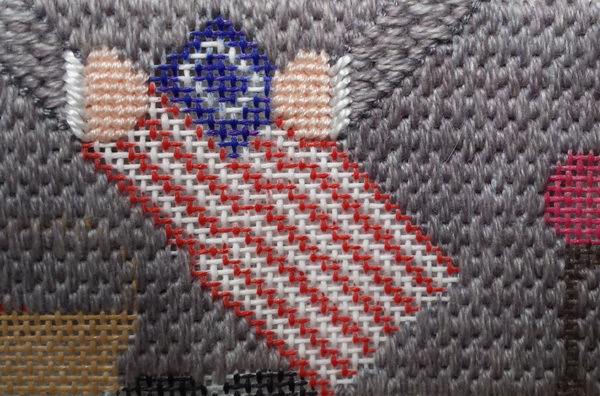 Anyway, I used Caron Impressions for the white feathers on the eagle. I love the way he looks and if you notice where the white feathers meet the black body and wing…I stitched the white up to about an inch from the bottom, then I stitched the black areas, and then went back and stitched the rest of the white feathers. 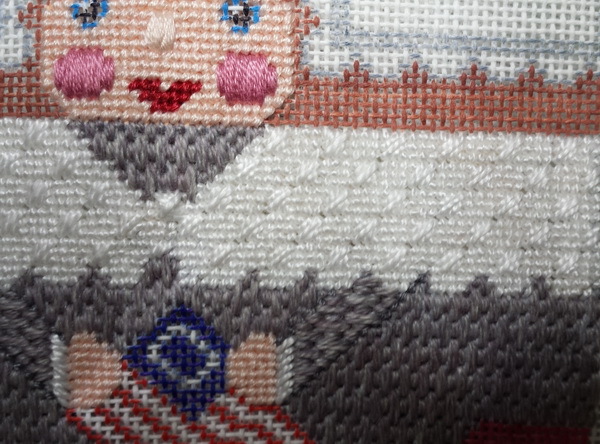 And really the hair on the back of this angel from ABS Designs (http://thecapestitcher.blogspot.com/ or http://www.absdesignsonline.com/ )is Random Stitch too…Random Bullion Knots. You can see hoe the stitch overlaps here; it does not split the threads but it is the same technique, Sure glad this was a small area. And here is Lucy…finally stitched. Lucy has 8 or 9 Epic threads for her fur. I like this Lucy but she is nowhere as cute as the real Lucy! My family thinks the needlepoint is wonderful, but then they like most things I stitch. I am showing you the back side too…I know this is not something we do very often but I want you to see that I am not methodical about where the Random Stitches are placed. But the very best piece of Random Stitch I have ever done is Leopold (Leo just would not do) the Lion. He lives in New York with my friend Linda H. She gave him his own chair in a special place in her home. Leopold took almost a year to complete and he had at minimum 15 different Epic threads in his mane…a couple of these threads were just dye lot changes. Dyelot changes happen with space dyed and overdyed threads. Leopold could almost walk off the canvas, he is beautiful! I loved him even before he was finishhed into a big pillow and got his own chair! P.S. May not be back for a couple days, I have two student handbooks to update.